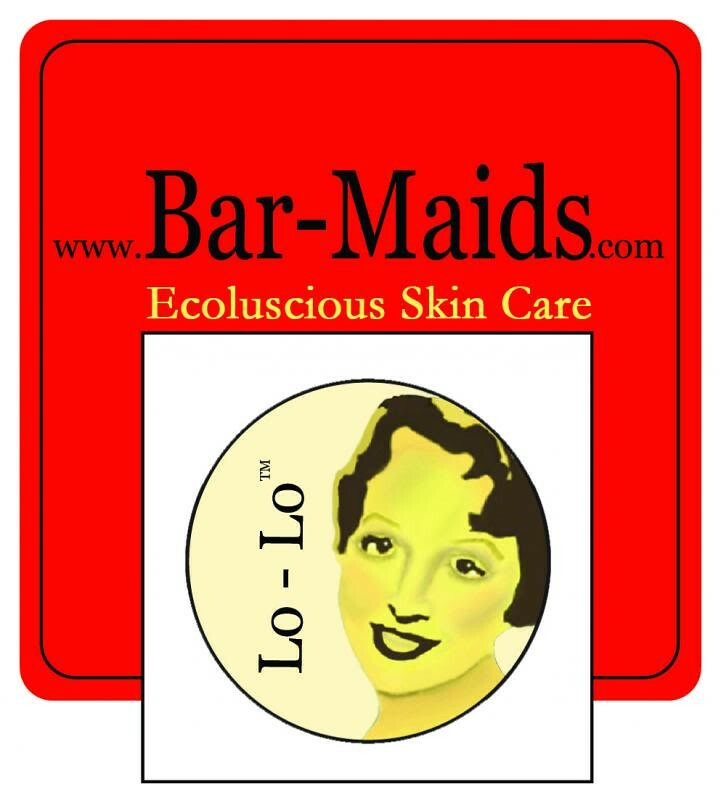 Bar-Maids was featured in an article by Hallmark (yes the greeting card company) along with Sephora, Wells-Fargo and a few others. They want you to know that they owe it all to our Advocates! Read about it here. Jasmin has knit one row on the Planum socks out of Biscotte & Cie #operationsockdrawer she is knitting for Genevieve. She mentions CC of the Geeky Girls Knit videocast. Gigi is knitting the Mini Water's Edge out of Abstract Fiber's Calder for Genevieve #matchymatchyKAL. Jasmin mentions a jacket on the cover of Jean Frost Knits [CORRECTION: Sculptured Knits ]. Also Gigi reminisces about the Einstein Coat. Jasmin quotes Rick Mondragon. Gigi is working on the Indie Burgh socks, and the Dianthus Superbus socks from The Knitter's Curiosity Cabinet, Vol.I For the #SummerofBeadsandLace, Gigi has knit two rows on the Asterope shawl out of Kraemer yarn. Gigi has started knitting on the Super Love Baby hat, out of Heritage by Cascade Yarns for the Head to Toe Project. Also, Gigi has blocked the Spiral Petal Shawl from Oat Couture, out of some mysterious, unlabeled mohair. For #countdowntooutlander #kiltmeknowKAL Jasmin got some ChiaGoo needles to cast on the Cointreau cowl out of Bijour Basins Himalayan Trail. 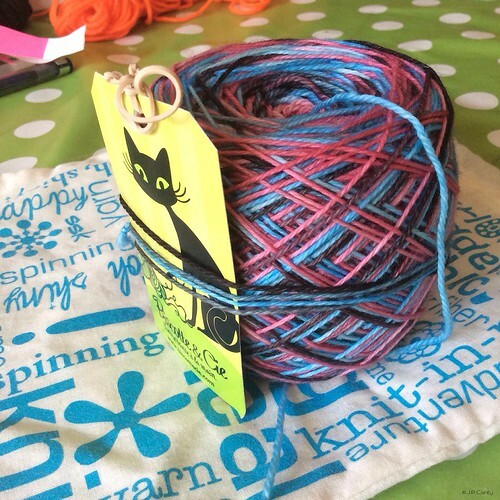 Jasmin mentions Maria from Subway Knits, CC from Geeky Girls Knit, and Kristen from YarnGasm. - Tin Can knits has published the Gramps pattern in extended sizes. We are co-hosting the Countdown to Outlander Knitalong on instagram, #countdowntooutlander, #kiltmenowKAL. This has to be creatively related to the Outlander series. Getting help from pocket Jamie is encouraged. This is being co-hosted by Maria from Subway Knits, CC from Geeky Girls Knit, and Kristen from YarnGasm. Entries will be judged on originality and general delightfulness. how to knit in the summer time. Gigi mentions the Featherweight cardigan. This week we are purloining The Knotty Girls and their procrastyknitting, and Shenanigans from the Fat Squirrel Speaks. Jasmin mentions the Windfall blanket. Jasmin enthuses about the SPAKAL. 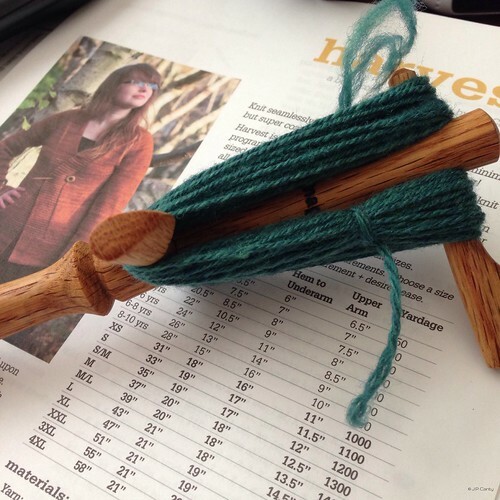 Jasmin spun a Targhee cross that had been prepared by Sherri of Morro Fleece Works. She is planning to knit the Harvest cardigan. She goes on about how much she loves her Matchless spinning wheel. Also, she ruminates about knitting the Ribbi Cardi. Gigi doesn't have much to brag about. Gigi hemmed a pair of ridiculous boxer shorts for Sam. We have cut out a dress for Genevieve, Simplicity 2265. Gigi needs to finish the Nemesis dress, before she starts sewing something else. Clean, Moisturize, Protect. These are the three commandments of basic skin care. Once in a while, one gets broken but no need to beat yourself up. We all try to ensure that we're as beautiful on the outside as we are on the inside, and to help you moisturize and achieve the results you are looking for, we offer Face Pudding - and five different types. All are deeply hydrating and safe and each one provides the kind of results you'd expect from us. With five types how do you choose the best one for your skin type? We got this covered! We’ve created the Tutorial of Face Pudding. Jasmin finished socks out of Biscotte & Cie #operationsockdrawer and still plans to win Stash Dash . Gigi finished her Neon Now vanilla socks and cast on tubesocks out of the leftover for Genevieve. Also, she is working on the Dianthus Superbus socks from The Knitters Curiosity Cabinet, Vol I .
Jasmin announces another Knit-Along: We are co-hosting the Countdown to Outlander Knitalong on instagram, #countdowntooutlander, #kiltmenowKAL. This has to be creatively related to the Outlander series. Getting help from pocket Jamie is encouraged. This is being co-hosted by Maria from Subway Knits, CC from Geeky Girls Knit, and Kristen from YarnGasm. 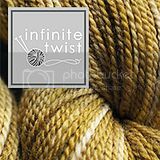 Britishbeaknits is the winner of this episodes prize, a skein of Simply socks Poste Yarn in the Colorway Nile. Participants need to post a picture to instagram with the #operationsockdrawer and have their ravelry username on their instagram profile. Gigi is repeatedly attacked by the Dr Watson sweater. We mention Sivia Harding and her amazing moebius creations. We are re-purloining a sock knitting technique from Twin Set Designs Jan and Ellen. This week we review Fun and Fantastical Hats to Knit , by Mary Scott Huff. Jasmin suggests these hats for Halos of Hope. Jasmin has spun a total of 575 grams of her fleece, of the 800 g she is planning to spin. She is planning to set up a spead sheet and a chart for keeping track of her progress next year. She is also planning to knit a small harvest cardigan for Genevieve. She is hoping to double dip her plying for Stash Dash. Gigi has only spun a measly 150 g. The fiber came from a brown sheep. **Genevieve offered to do the shownotes while Mom and I have been sick. Either she (or Mom) will post the shownotes by 7/20. Gigi has been working on the Water's Edge from Coastal Knits LINK out of Abstract Fiber's Rothko #matchymatchykal. Jasmin has been working on Biscotte & Cie in the Gazania colorway. Gigi has been working on vanilla socks out of Neon Now. We are stealing a good idea from Twin Set Design. Jasmin mentions Amy Beth, from the Fat Squirrel Speaks, the Knit Girllls, A Playful Day, Subway Knits, Yarngasm, DownCellar Studio, Commuter Knitter and the Geeky Girls Knit videocast. Gigi is also working on the Dianthus Superbus socks from The Knitters Curiosity Cabinet LINK out of Wildfoote. Gigi waxes poetic about Hunter Hammersen's designs. She is also working on the Indie Burghe socks. She is working on a preemie hat for the Head to Toe project. She also bound off the shoulders of the Dr Watson sweater. The Summer of Lace and Beads is ongoing, check out the thread on the forum. Entries will be judged on originality and general delightfulness. Judging criteria purloined from Sasha Torres of Sheepspot. The next prize is a skein of Poste Yarn from Simply Socks Co, in the colorway Blue Nile. using a Hanson e-spinner for a beginning spinner. Also: The Gentle Art of Plying. Jasmin mentions the Matchless, and Carolina Homespun. Gigi has been attacked by her Odelia that she is planning to finish for the #stashdash2014. She is knitting it out of Silk and Wool by Tess Yarns. Also, she hid the yarn she bought to knit the Rainshadow from herself. This week we purloin the literature bit from 2Knit Lit Chicks. We talk about the Outlander Series LINK. We are excited about the contest sponsored by Bijou Basin Ranch. We talk about the lovely Himalayan Trail yarn we are going to knit with. Jasmin has chosen to knit the Cointreau. Gigi will knit a cowl from Sivia Hardings Book of Cowls. There is an Outlander thread in the forum. #countdowntooutlander will be launched next week. Gigi has been spinning long draw and she has weighed her fiber into 25 g nests, and is trying to spin a nest a day. She is planning to knit the Harvest cardigan for her SPAKAL project. 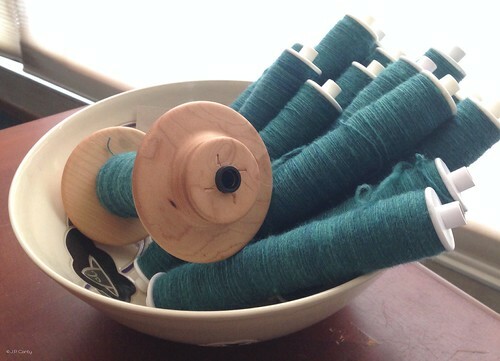 Jasmin is spinning 25g a day with an attenuated woolen spun, on her Schacht Matchless, and storing them on 6inch Schacht bobbins. LINK She is spinning a Targhee cross that she purchased from Morro Fleece Works. She is also working on Stash Dash and plied up a storm. Jasmin mentions Jen from the Commuter Knitter podcast, MrsShoo from the In A Sknit podcast, Meghan from the Stitch It! podcast and the Halos of Hope Podcaster Throwdown. She thinks finishing her Breezy cardigan will help her win the Stash Dash. Gigi has blocked the Dr Watson sweater. She also excavated the Odelia cardigan, out of Tess Silk and Merino, from Area 51, and is working on it. Gigi also wants to put beads and fringe on the Lady Eleanor shawl that she was gifted, and there is a discussion whether that should count toward the Stash Dash. Jasmin wonders whether blocking lace counts toward the Stash Dash and thinks it should. Gigi agrees and thinks she should block her large Aeolian, which is languishing, a block away from being finished. Jasmin is working on the Vincent and the Doctor from Quere Fibers., the Biscotte & Cie in the Gazania colorway. Also a pair of socks Poste self-striping yarn in Ibiza. Gigi is working on the Loasa Lateritia from The Knitters Curiosity Cabinet Volume II, and she finished the Toe up Tulip Socks .Jasmin mentions Franklin Habit. Gigi set up to knit a preemie had from the notorious Head to Toe Project. Jasmin mentions people who helped/ offered to help: the Knitmoreintern, Laura, the Joy of Cooking Fairy, Jade from Geek Girls Craftpodcast, and Cascade Yarns, who generously donated yarn. We attended the Halos of Hope-Athon at Purlescence. Jasmin mentions Rachael Herron and the romance novels set in the lovely fictional town of Cypress Hollow. We visited with Pam Hashke. Halos of Hope does not accept preemie hats, however we love to collect them. Jasmin mentions Melanie of the Savvy Girls podcast. The Summer of Lace and Beads thread has been started last week, and Sivia Harding has a sale on her patterns. Jasmin knitted her Ophidian shawl, Gigi knit two Ophidians, and her Heart to Heart shawl, the prize for the Halos of Hope shawl, and she has picked up yarn to knit the Rainshadow, which Gigi mistakenly called Sunshadow. choosing colors that work together. Gigi suggests a Color Wheel , Jasmin mentions Design-Seeds, Crayola Crayons , and Miss Babs kits. The second question is about backing buttons, and Jasmin mentions the box of backing buttons from the Cleaner supplies, Jasmin also mentions her Namaste Harlow bag. Jasmin suggest looking through the Buttonband Thread in the Forum. We mention the Button Emporium. We talk about the Acorn cardigan. THIS IS THE LITTLE OAK CARDIGAN! Jasmin was working on her Biscotte & Cie socks that she kept in her Erin Lane bag. Genevieve managed to sabotage the knitting by knocking over a chair, and managing to bend the needles in the process. Gigi was working on her Loasa lateritia sock from the Knitter's Curiosity Cabinet, volume I and managed to knit the heel flap too wide, frog and do over. Gigi had finished the second repeat of chart B of the Asterope and found herself 5 stitches short. She read the instructions ahead, for a change, and found a solution for her dilemma. She found she had to frog anyway, and she loves her life lines. She had finished the leg of the Indie Burgh socks out of Fluormania and found they are too wide for her leg. 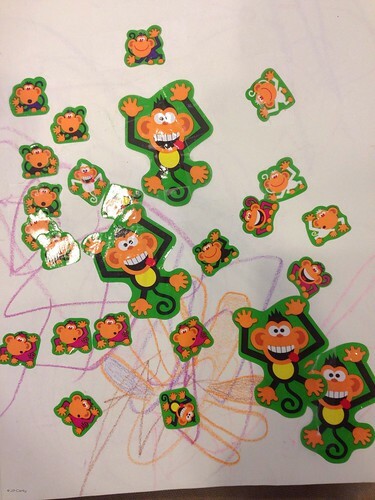 Frogged. This week we are purloining "Guess Who is Crazy?" from the Knit Girllls. This week we review Knitting with Wire , by Nancie M. Wiseman. We mention our Professional Organizer. Jasmin wonders what projects for the Summer of Lace and Beads need to have. They need to have either beads or lace. Bonus if they have both. In order to win Stash Dash, Jasmin is plying as many singles as she can. So we rinsed and hanged some plied yarn. 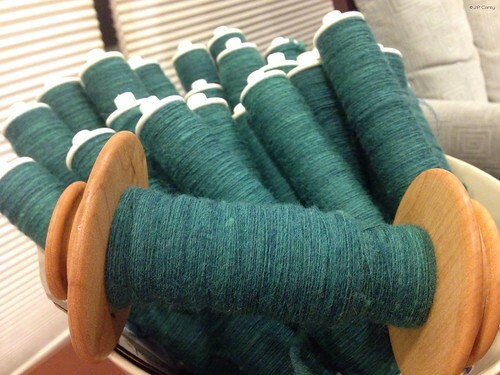 Jasmin is plying more singles out of Abstract Fiber out of green Merino/ Silk. 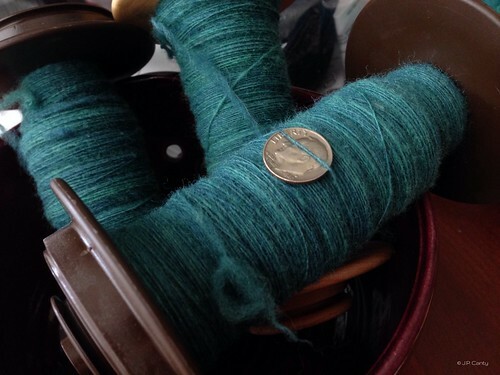 Gigi plied the singles she had spun out of Gourmet Stash, with an Andean ply. Jasmin mentions Judith MacKenzie McCuin , Tour de Fleece and the SPAKAL start this week. Tour de Fleece live chat will happen Saturday, July 5th in the Team Sasquatch group.